Stephen Colbert weighed in on the hypocrisy of Fox News regarding its lack of coverage on the Ivanka Trump email scandal. 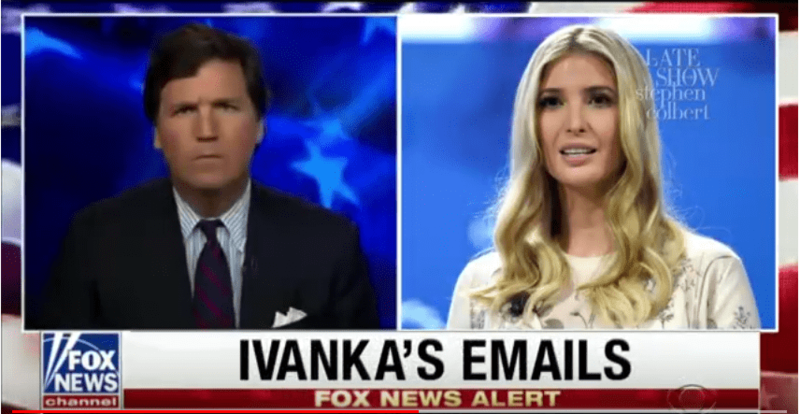 The Late Show with Stephen Colbert last night compared Fox News’ deafening silence about Ivanka Trump’s using a private email account for government business with their coverage of Hillary Clinton’s doing the exact same thing. “Why would a woman, a lawyer no less, one experienced many times over in the ways of Washington risk placing classified information on an unprotected, non-government server,” one Fox News host said at the time. “Hillary committing multiple, serious, felonies, crimes, mishandling confidential information,” said Sean Hannity. Ivanka Trump frequently used her personal email account to communicate with cabinet secretaries and her assistant in 2017, according to a White House report. Ms. Trump said she was unaware of the rules about using her personal email account for government business. “To address misinformation being peddled about Ms. Trump’s personal email, she did not create a private server in her house or office, there was never classified information transmitted, the account was never transferred or housed at Trump Organization, no emails were ever deleted and the emails have been retained in the official account in conformity with records preservation laws and rules,” spokesman Peter Mirijanian, said in a statement. “When concerns were raised in the press 14 months ago, Ms. Trump reviewed and verified her email use with White House counsel and explained the issue to congressional leaders,” Mirijanian added.